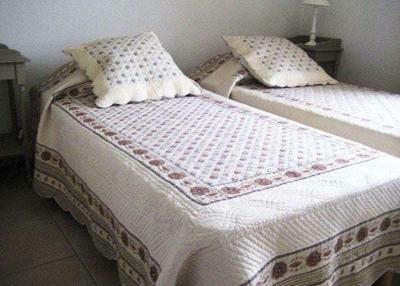 Large comfortable bed, complimentary tea/coffee and biscuits. Great view of golf course. 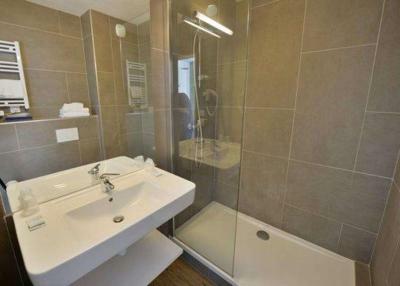 Golf course on site and easy tram access to Montpellier. Beautiful place ,low rates for season , large apartment,kind staff ,thank you Jihanne for your availability. Everything, beds were lovely and big, very comfy. The restaurant was amazing food, big portions. The staff were very helpful, and friendly. The pool was great for the kids to cool off and have a swim. The sofa bed was surprisingly comfortable. Some staff were very helpful and we were able to change rooms when there was a problem with the air conditioning. Rooms were to a good standard. Food in the restaurant was good. The parking lot was big (and free) easy to go with a car. Rooms were nice and clean. Breakfast was very good! This resort is located 6.2 miles from Montpellier and its sandy Mediterranean beaches. It features an outdoor swimming pool, fitness center and a golf course and putting green. Quality Hotel du Golf Montpellier Juvignac offers soundproofed rooms, decorated in a golf-theme and apartments and suites with air-conditioning, and free Wi-Fi. The hotel’s chef serves inventive, regional cuisine using seasonal products. The dining room offers views over the golf course. Guests can also explore the local vineyards and medieval villages. Free public parking is available on site and 2 recharging points are available for electric cars. When would you like to stay at Quality Hotel du Golf Montpellier Juvignac? 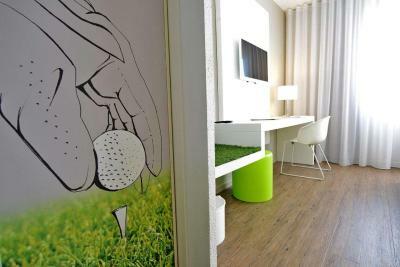 With a golf-themed décor, this air-conditioned room features a flat-screen TV, telephone and a private bathroom. With Provencal décor, this air-conditioned suite features a bedroom, a sitting area with a sofa bed, a kitchenette, satellite TV and a private bathroom. Please, inform the property about the number of children staying with you. You can use the Special Requests box when booking. For stays of more than 6 nights, cleaning fee is not included. With golf-themed décor, this air-conditioned room features a view of the golf course, a flat-screen TV, telephone and a private bathroom. This room can accommodate a sofa bed for 1 or 2 children under 12 years old. With a Provencal décor, this air-conditioned suite features a bedroom, a sitting area with a sofa bed, a kitchenette, a flat-screen TV and a private bathroom. It also has a balcony with views of the golf course. This family room has a seating area, electric kettle and sofa. This double room features a tea/coffee maker, satellite TV and soundproofing. - Half a day access to the nearby Spa De Fontcaude's "Heat Experience Zone" for 2 people, including access to the swimming pool, sauna, hammam and ice fountain. Quality Hotel du Golf Montpellier Juvignac offers 46 golf style contemporary rooms and 40 spacious charming Provence style apartment-suites. Totally equipped the hotel offers a WIFI connection throughout the hotel, a gym facing the golf course and a summer pool by the large panoramic terrace. Located a stone throw away from Montpellier, Sud de France's capital, Quality Hotel du Golf Montpellier Juvignac enjoys a peaceful residential surrounding and offers an easy access and parking for our guests. Do not miss a visit at Palavas-les-Flots and Carnon's beaches, or Sète (Languedoc Venice), the medieval village of St Guilhem-le-Désert (UNESCO heritage) and some of the best vineyards located just around the hotel. House Rules Quality Hotel du Golf Montpellier Juvignac takes special requests – add in the next step! 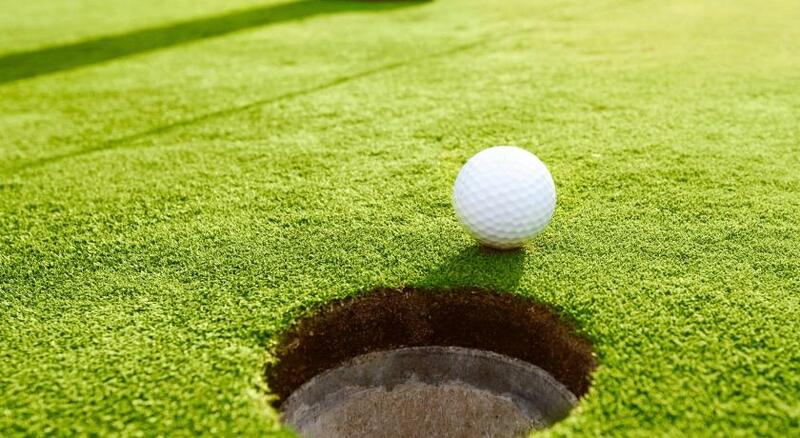 Quality Hotel du Golf Montpellier Juvignac accepts these cards and reserves the right to temporarily hold an amount prior to arrival. Please note that when booking the property requests that you state the number of people and the ages of the children, if any. Please note drinks are not included in the half-board formula. A baby cot can be accommodated in the hotel rooms, except in the Standard Double Room. 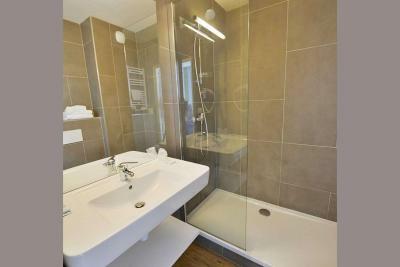 The shower was a bit weird, but very clean bathroom. The decor looks tired and could use an update. The location was a little further away from the city centre than what we initially thought or calculated through google maps. Overall, the place was great. The mattress was the worst thing. My room was close to the lift and that thing was a nightmare instrument from the hell. My bathroom was smelling terrible. And there were grass stains everywhere in the hotel. Conditioner for hair would have been good!! The food in the restaurant was average and the kids didn’t eat their meals. Not sure if it was just a bad night or if that’s normal. The room we were in had bad air conditioning. Difficult to find even when using GPS. No access to pool from inside the building.